Mason Jars + Candles = Spring! May 27, 2015 September 30, 2015 / Elizabeth T.
My absolute favorite out of the three, this one just seems to pack in that really distinctly sour and savory scent of peach, and I love the citrus tones of the orange peel and yellow mandarin. The sweetest scent out of the three, the scent of the fresh cherry nectar and apple slices really stand out, and this candle always makes me feel like a princess in a romantic fairy tale. The freshest out of the three, the scent of watermelon is definitely stronger than the hints of lemonade, though I find the scent to be quite refreshing and reminds me of those lazy summer days, just lying on a lounge chair next to the pool as my sweat-kissed skin soaks up the sun’s warm rays. 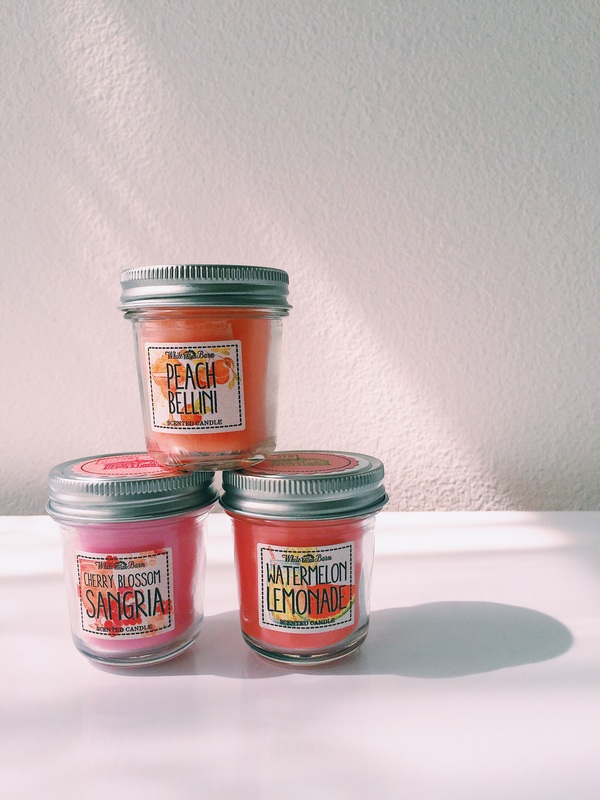 Loooove all these candles, they look like a summer breeze, love it! so cute♥ it looks great! What if we follow each other? Let me know, sweetie! Sure thing dear! 🙂 ❤ Followed! Love your OOTD posts! These candles looks lovely ! I would’ve love to have the watermelon lemonade one ! Yes, and they smell so wonderful! 🙂 The watermelon lemonade one is such a refreshing scent! My wife and I are addicted to scented candles. Thanks for sharing and please check out the latest interview with Stardust Bohemian. She is one cool lady. Thank you for the comment! 🙂 And I loved the interview! It’s great to hear about different eye pieces! And you have an awesome blog! So impressed by the variety of writing samples in your portfolio! Haha that’s how I felt too! 🙂 The packaging is so adorable! And thank you so much for dropping by my blog!